Many environments have the requirement to be flexible to what platform they are running. Flexibility allows for the ability to move, migrate and leverage data between each of their virtual environment assets. This also applies to extending into other cloud environments, whether that be for backup retention purposes, using a Veeam Cloud & Service Provider partner for managed service providers or expanding the production environment into the public cloud to offer further flexibility to the on-premises infrastructure. The agentless architecture for Veeam Availability for Nutanix AHV consists of a Veeam Backup Proxy Appliance that will reside within the AHV cluster. The requirement here is one proxy per cluster, and as a v1 product with extensive beta testing, we have not seen a requirement to scale this function out. The Veeam Backup Proxy Appliance is a lightweight installation, offering an intuitive Prism-like web UI that is used to manage the appliance itself, configure, schedule and run backups, and perform both full-VM recoveries and disk-based recoveries. The Veeam Backup Proxy Appliance is required to have communication with a Veeam Backup & Replication server for authentication purposes, but this also extends recovery capabilities with the ability to perform file-level recoveries and application item-level recoveries using the established Veeam Explorers. Also, as an extension to the backup policy, you can leverage backup copy jobs or send AHV backups to tape. 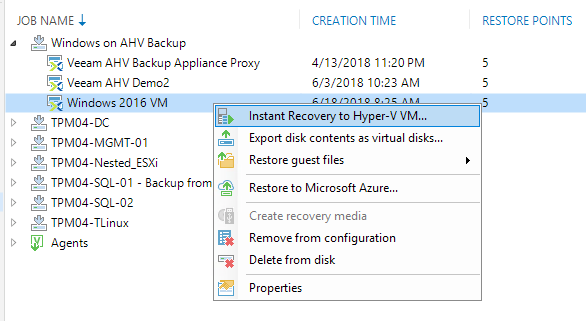 Finally, there’s the ability to do more with AHV data, like converting those backup files into VMDK, VHD and VHDX for use in different virtual environments, as well as sending and converting them to machines in Microsoft Azure, which is ideal for a testing environment with infinite and scalable resources. The final thing to mention on the architecture is where the backup files are stored — a Veeam Backup & Replication repository, the primary reason for the communication and authentication from Veeam Backup Proxy Appliance to the Veeam Backup & Replication server. Because of the requirement for a Veeam Backup & Replication server and repository, a common question is “if we are moving completely to Nutanix AHV as our only hypervisor in the environment, how do we gain access to the required Veeam Backup & Replication components if we do not have a license for it?” This is essentially the same question in Veeam Agent-only customer environments with no virtualization in place, so the same answer applies. All Veeam Availability for Nutanix AHV licenses (and Veeam Agent licenses) are delivered with a zero-socket license for Veeam Backup & Replication at no additional cost. The zero-socket license unlocks Veeam Backup & Replication functionality for AHV backups in environments where an existing Veeam Backup & Replication for VMware vSphere of Microsoft Hyper-V instance does not exist. As mentioned above, many environments will have the requirement to run a multi-hypervisor infrastructure for numerous reasons. The possibilities from a management, backup and recovery perspective for AHV environments that have been brought with the release of Veeam Availability for Nutanix AHV have already been discussed, but if we were to also have a VMware vSphere or a Microsoft Hyper-V footprint alongside AHV, does this mean I have to have additional Veeam management components? No, that same Veeam Backup & Replication management server and repository can be used for Nutanix AHV, VMware and Microsoft Hyper-V backups, as well as Veeam Agent backups. However, in some circumstances, there may be a requirement to have separate management for these environments, and that can be achievable using the zero socket license applicable in both AHV- or Veeam Agent-only environments. Remember, Veeam does not license the components that are licensed on the production workload, meaning you are able to have as many Veeam components as you see fit. The post Veeam and Nutanix AHV in a multi-hypervisor environment appeared first on Veeam Software Official Blog.